I lived in Texas for seven years, it's really where I came to love beer (and where I came of legal drinking age!). During my time in Dallas and Fort Worth I made countless road trips to Austin. On a trip in 2013 we drove a little ways out of town to visit a small hill country brewery called Jester King. The beers were funky but had a sense of place. "That was pretty cool," we shrugged as we left. Over our next several visits I noticed the parking lot started to fill, then overflow and lines at the single bar formed, and then became longer. But I loved the hills, and the unique beers, and the pavilion serving farmhouse pizza so much that I had my birthday at the 2015 montmorency vs balaton release. Mind you this release brought lines, but we still found parking along the side of the highway and had plenty of room to drink beer, eat pizza, and sing happy birthday. Fast forward to 2017 - I'm back in Austin and now Jester King is a big deal. People tell me stories of expanded parking lots, extra bars, lines for both beer and food, and tables all the way up the hill. All of these new details were exciting to hear about, but almost a little scary. What if I didn't love Jester King anymore? What if I didn't even like it anymore?! On the last day of our visit, a sunny Saturday that (thankfully) didn't align with a beer release, we drove out to Jester King, pulled into the familiar parking lot and were guided to the back where we pulled....into another parking lot, followed the curve through that and ended up in a third parking lot, and it wasn't....bad at all! It was nice to have a place to park instead of leaving my car in the mud along the side of the road. The view walking up to the brewery from the overflow lot. Can you say hill country?! I walked toward the pavilion that housed Stanley's Farm House Pizza, (that now had walls, and an extra bar!) and felt that same nostalgic sense of a welcoming relaxed brewery in the Texas hill country and any reservations I had totally melted away. Was there a line for the food? Uh, yess. Was there a line for beer? Only at one of the bars! Was there new cool stuff?? Yes and yes!! 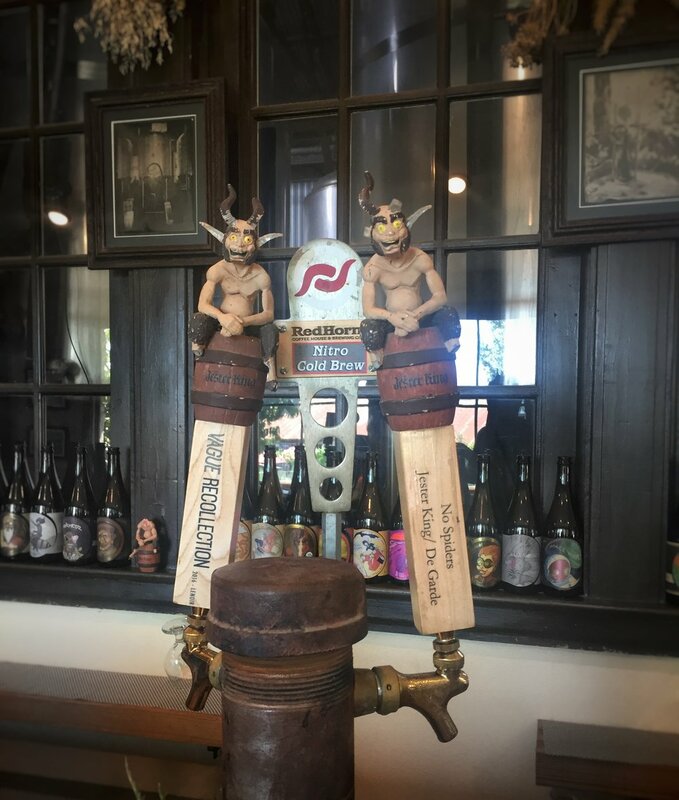 In addition to the bar with draft beer that had always been the taproom there was a second bar that served cans and bottles of beer from guest breweries as well as Jester King. The brewery has also really figured out its merch situation giving fans the label art they love on shirts, glasses, stickers and in my case tank tops, I got two! And get this - a single tab could work on any of the bars and merch and you can close it wherever you want too, a dream! Inside the pavilion that houses Stanley's Farmhouse Pizza and the secondary bar. The brewery tours don't require a reservation and although there were far more people at the brewery than there were back in 2015 there was also a lot more space for people to hang and drink. I didn't feel crowded although things did seem a little bit louder. While the brewery really has this volume thing figured out, Stanley's Farmhouse Pizza is still catching up. The line was well over 15 minutes both times I got in it and pizzas take about 20 minutes from order to pick up. They do text you when your pizza is ready so you can go back to enjoying your beer which is nice. Stanley's famous garlic knots are still ready upon ordering - which if you ask me is the source of their fame. If you wait in line smelling pizza and getting hungry these garlic knots really do seem like salvation. Stanley's has some great guest taps - I got a Prairie Paradise on tap down there. There is a "beverage only" line that moves quite quickly. As we left by walking down that hill to the overflow parking lot's overflow parking lot, I had to marvel at how Jester King has been able to grow, both in production and popularity, while maintaining the sense of idenity that the brewery has had for many years. Austin has Uber again! The parking lot is much bigger at Jester King but it's more safe to skip driving all together if you're planning a day of drinking. Are you gluten free? vegan? picky about eating? You can bring a snack/picnic/lunch! Stanley's is great but the menu is definitely limited and as I said above, the line are long. Take bottles to go. Many of the bottles sold at the brewery aren't sold anywhere else. If you're adventurous in your beer drinking, you'll love them. Plus, you can close your tab at the merch tent and save yourself some time and line-standing. It's outside, it's all outside. If it's cold out, hot out you'll be feeling that during your visit. If I'm not being clear - you will. be. outside.